Drum Storage Racks! 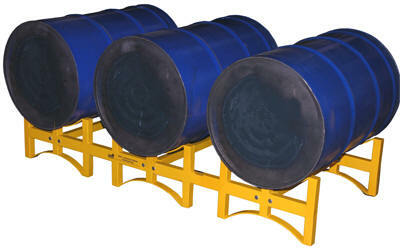 Stackable 55 Gallon Storage Drum Rack.These steel drum storage racks have two way forklift access. Not recommended for stacking more than four racks high. All steel construction with 1/4" formed steel 55 gallon drum storage cradles. Bolt together assembly with hardware included. Works well with the Hydraulic Drum Stacker and the Drum Positioner. Powder coated yellow. See chart below for specs. Available in 2 Drum and 3 Drum Capacity. *Please select appropraite option when ordering. 45" x 30" x 12-3/4"
71" x 30" x 12-3/4"
Drum Faucets 2" "Molasses Gate"